The Hawks were ruthless with their attack on the ball and the man. 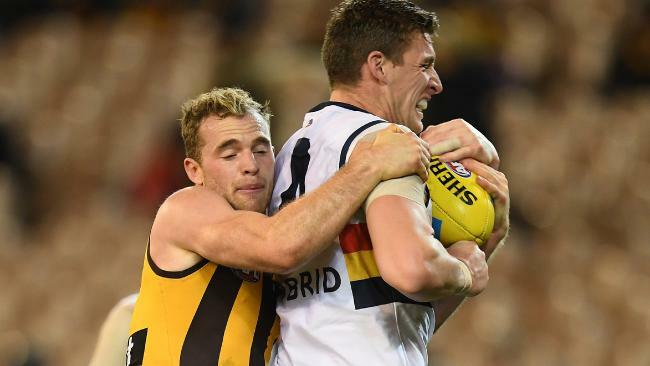 HAWTHORN coach Alastair Clarkson on Saturday night praised his team's defensive efforts after restricting Adelaide to the third lowest score in the club's history, as former Saint Leigh Montagna maintained something was "wrong" with the Crows. The Hawks made the Crows' return to the MCG for the first time since losing last year's grand final a miserable one, keeping them to 4.8 (32). Clarkson was delighted with the way the Hawks responded to a wasteful first hour to dominate the second half, off the back of seven goals to nil in the third term. During the game Montagna said in commentary the talk of player dissent levelled at the Crows since their controversial pre-season camp appeared to have some substance on the back of their spectacular fall from grace this year. "It's obviously something is not right with the Crows at the moment," Montagna said. The Crows are fast losing touch with the eight, with key games against West Coast, Richmond and Geelong to come after the bye, which could end their finals hopes. Pyke said the reports of disharmony had been "blown out of proportion … I think we are not playing well at the moment." "We've had some personnel out throughout the season and that's taken a toll, but we have also got experienced players not playing well enough. "It is a different journey for us this year … we don't accept where we are at, but we want to stay together and galvanise (as a group)." Pyke said the Crows' bye had come at the right time as they reflect on a poor first half of the season, as he suggested up to four players could return after the break including Rory Sloane. Clarkson said the club's efforts to win stoppages in the third term was pleasing, as was the way they were able to get goals from halfback, including three from James Sicily in the third term. 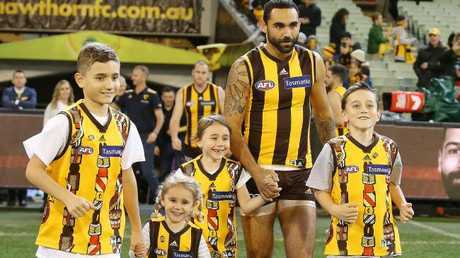 Saturday night was a special occasion for Shaun Burgoyne, who celebrated his 350th game in style with a fine last-quarter goal, with his coach saying he is still a strong chance to play on next season as a 36-year-old. 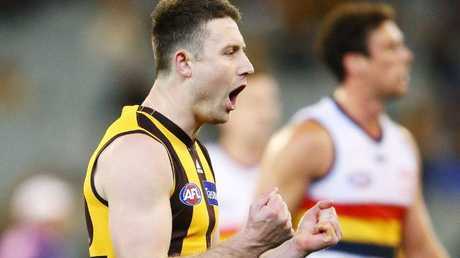 The Hawks lost defender James Frawley shortly before Saturday night's game due to a serious migraine, but Clarkson was delighted with the way the team responded. "We got five goals from our half backs tonight, four of those came in the third quarter, which was pretty important for us." Tom Mitchell led the charge through the middle of the field, as the Hawks obliterated the Crows at the clearances (49 to 26, including 18 to 1 in the third term), with Jaeger O'Meara also in fine form.